It was a mixed night of emotions for the five Howard County football squads in the first round of the IHSAA state football playoffs. The county stood 3-2 when the lights were turned off, with one of the losses by one point and the other in overtime. In Kokomo, the Wildkats posted its first shutout of the season over a hapless Fort Wayne Wayne team. Western traveled to Peru and posted its fourth shutout of 2011. Northwestern made the long trip to Veedersburg and stole a one point win away from the previously undefeated Fountain Central Mustangs. 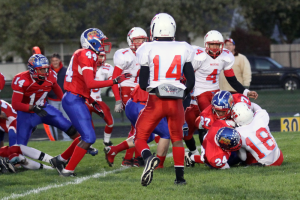 Eastern was ready to strike gold when they fumbled late to lose by one point in Tipton. And in Center, Taylor dropped an overtime heartbreaker to Delphi. Armon Bridgeforth found yet another way to enter the Kokomo record book as he grabbed a school record three interceptions – all in the first 17 minutes of the game – to lead the Kats to its largest margin of victory sectional win in school history, 52-0 over Fort Wayne Wayne (0-10). He returned the second interception 63-yards for his second touchdown of the night. He led off the scoring with a 2-yard run and added a third touchdown in the second quarter on an 11-yard scamper. He now has 10 career interceptions, which is second best in school history. Matt Elkin had 12 from 1983-1984. The win marked the first sectional victory for Kokomo since 2008, and only the third since 1997; so the five-time North Central Conference champions wanted to prove something with a big win. Kokomo (8-2) outgained the Generals 220-95 yards offensively as Kokomo pitched its first tournament shutout since 1985 and third in KHS sectional history. The defense was so dominating that three players scored defensive points – Bridgeforth on his second interception, lineman Cameron Colby on a safety and Bo Butler on a fumble recovery. The rest of Kokomo’s scoring included a Butler 31-yard touchdown run, a 26-yard Will Haynes touchdown run, a 1-yard Michael Copeland run and a 27-yard field goal from Blake Brutus. The Kat kicker also had five extra-point kicks which places him fifth all-time in school history with 40. For the second time in three seasons, the Western Panthers (8-2) started the sectional tournament with a shutout victory as the Class 3A No. 12-ranked squad beat Peru 34-0. The Panthers were never challenged as they led 14-0 after one quarter and 28-0 at the half. The Panthers started the 2009 tourney with a 41-0 shutout at Maconaquah. For a team that didn’t play its best game, the statistics sure didn’t agree. The Panther defense held Peru (0-10) to negative five-yards of total offense (negative 12 rushing and positive seven passing). Christian Glenn led the way with a pair of interceptions. Meanwhile, Quin Fields once again led the Panther offense with 168-yards through the air and two touchdowns, while running for another. Ronnie Smith caught the two TD passes (18 and nine yards), while James Davis had a two-yard touchdown run and Corey Hinkle added a one-yard run in the fourth quarter. In what may have been the best game in the state, Class 2A No. 7-ranked Northwestern (9-1) gambled with 18 seconds left and beat No. 7 Fountain Central on the road (the two teams were tied in the final Indiana Football Coaches Association poll). Fountain Central (9-1) moved up a class this season; they were the two-time defending Class 1A state runners-up. Trailing 41-34 late in the game, Marcus Salazar capped a long Purple Tiger drive with a one-yard touchdown splash. Down one point, the Tigers decided to go for the two-point conversion and quarterback Tanner Martin found wide receiver David Alexander in the end zone to give the Tigers a 42-41 lead and the eventual victory. Salazar capped a big offensive day with the winning touchdown, but he also had the first score of the game on a 51-yard run. He finished with 59 of Northwestern’s 98 rushing yards. Martin was 10 of 16 through the air for 282 yards and three touchdown passes. Alexander caught two and Trenton Brazel had the other. Kylan Dubbels added a short touchdown run on an evening when every score mattered. Oh, so close. That is how the Eastern Comets will remember the end of the 2011 season. One week after losing the Mid-Indiana Conference crown to Northwestern by six points, the Comets saw a first-round sectional win slip away on the final play of the game at the Tipton Blue Devils (6-4) home. Down 28-27 and gaining possession on its own 35-yard line with 32 ticks left, Eastern (7-3) drove to the Tipton 10-yard line with eight seconds left. Quarterback John Horner found himself with two choices – throw the ball away or run for it after he could not find an open receiver. He chose the latter, got to the eight yard line and was hit by a Tipton player. The hit resulted in a fumble and the end of the game. Edwards said he would not have changed anything on the final series, and in fact, saw the same opening that Horner saw and tried to get through. Blake Thomas had another sensational night for the Comets, scoring on touchdown runs of 10 and 94-yards, and catching a Horner pass for a 60-yard touchdown. He finished the night with 154-yards rushing and 100-yards receiving. Horner was 10 of 16 for 203 yards in his final game as a Comet. The table was set for the Taylor Titans (1-9) to score its first sectional win since 2009. But after holding a 14-7 lead deep into the fourth quarter, it just was not meant to be as Delphi (1-9) tied the game and won in overtime, 17-14, after Taylor fumbled on its possession. “For us, having a chance to compete and battle and experience adversity on a number of different levels; as much as you don’t want to lose, we battled to the end,” said Taylor head coach Eric Davis. Quarterback Dayne Tomlinson led Taylor with a touchdown and 131 rushing yards but he did not play the final seconds of the game or overtime due to concussion symptoms. Davis said he should fully recover. Taylor trailed 7-0 at the half, but Davis said the team was upbeat and ready to play the second half to win. Kokomo, Western and Northwestern move on to the second round of the IHSAA sectional tournament this Friday night. For previews of the individual games, see page 7 in this edition of the Sports Journal. This entry was posted in Eastern, Football, High School, IHSAA, Kokomo, Northwestern, Sectionals, Taylor, Tournament, Western, Wildkats. Bookmark the permalink.